There are so many things I forgot to add to my third trimester checklist the first time around. The truth is that many people will expect you to know what to do–but that can be difficult considering you are wading utterly unfamiliar waters. Crossing things off of lists is truly exciting for me (hah! ), so I rarely miss an opportunity to do this. 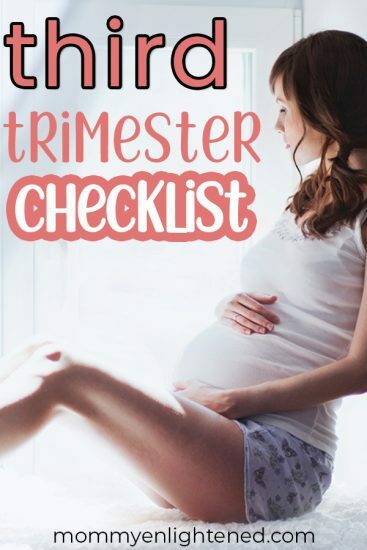 Consider writing your third trimester checklist down because pregnancy brain is actually a thing! When writing out your checklist, it’s important to remember you may not get to everything. And that HAS to be okay. You do the best that you can, but remember that it’s NOT worth stressing yourself out over. So don’t do that. Anyway, I feel like I learned a lot the first time around, and I found I had a good understanding of what was actually necessary when it was time for my second round of pregnancy. There are some things you can do to help better prepare in the third trimester you for your hospital stay. Luckily, most childbirth facilities offer both of these kinds of classes. You can certainly check those out if you are interested in going in person. Personally, I prefer to do everything online if I can. I took an online birthing course that I watched nestled on my couch with my many cats. The best online birthing class I have found is from Hilary at Pulling Curls. She’s a labor and delivery nurse, so she DEFINITELY knows what she’s talking about when it comes to what to expect from your birthing experience. She has a private community so you can have somewhere to ask all of those awkward questions…because yes–you will probably poop during childbirth. If you are giving birth at a regular hospital, most facilities will let you come and tour the birthing center. In your moment of induced panic when the real deal rolls around, you don’t want to be scrambling about, trying to figure out which floor you are supposed to be on. Help the experience go smoother for yourself and tour the hospital and check to see if pre-registering is an option. If it’s important to you to have everything go a certain way, definitely write out your birth plan. Do you want pain meds? Do you want to delay cord clamping? Do you want skin to skin immediately? Do you want to allow visitors while you are in the hospital? This is by NO means a complete list – just some things to start thinking about. I did not write a birth plan in my third trimester, but I was not very worried about things going a specific way. It was important to me to be out of pain and to have a healthy baby. Both of these things worked out, and that was what was important. I also had my husband in the room with me to advocate for anything else I wanted or needed. If you plan on going in alone or have a squeamish partner who may be gagging into a bag during the delivery, consider writing down what you want, even if it’s only a few things. Packing for your hospital stay can be difficult, as we don’t always know what we are going to need. Luckily, most hospitals have most of the supplies you need on hand. Personally, I went pretty minimal with my packing. I kept a bag in each of our cars so that we would be prepared regardless of which vehicle we were in. Here are some of the necessities you definitely don’t want to forget. Make sure your partner packs a bag too! There are some pretty standard newborn procedures that your baby will go through. These vary by state, so definitely get on your state’s local health department website and check out what your state requires. These are all good things for the baby, but it’s nice to have the information beforehand, so you aren’t surprised when the nurses have to whisk baby away for a while. Some parents elect to skip some of these procedures (which no judgment – we all try and do the best by our babies!) Talk with your pediatrician if you feel unsure. Cord blood is the blood that remains in the umbilical cord and placenta following birth. This blood is usually discarded, but more and more parents are electing to save this for later. Your baby’s umbilical cord blood is rich in stem cells, which can help treat or cure a variety of diseases and disorders. It can be costly, which is why so many families may be hesitant. This procedure is not standardized everywhere, but it is totally safe for your baby. If your hospital and doctor allow it, consider saving this blood and putting it in a blood bank. You never know when something simple like this could save your child’s life down the line. I worked for seven years as a veterinary technician, so I ended up accumulating a lot of pets along the way. Most doggie daycares require scheduling at least a couple of weeks in advance, and if your baby is born around a holiday it should be sooner. If you have friends or family that are willing to take care of your little ones, that is great. Often though we don’t like to burden our families with more work – so it’s important to figure out your options. Remember that your pet is also going to have an adjustment period to baby, so having them stay somewhere else can help you better control the first meeting between baby and pet. I remember I was terrified that I would put the car seat in incorrectly. Luckily, the hospital checked this out before even letting us take our baby home. If you aren’t confident with how you installed your car seat, some fire departments will check for you. Otherwise, you can search around for a car seat certification tech in your area. A new mother should be celebrated just as much as a new baby. Adding some motherhood tasks to your third trimester checklist will help you be better prepared for what’s to come. For breastfeeding, this class from Milkology is excellent. Stacey goes into thorough detail regarding the science of producing milk, provides step-by-step instructions on how to breastfeed properly, and gives solutions to different issues that may come up. You can get bits and pieces of knowledge online (KellyMom is one of my fav resources), but if you are looking for something that can give you everything in the same place, this is it. Breastfeeding is HARD work, but there are things you can purchase to make life a little easier. The following are a list of things you can pick up to help you be better prepared for breastfeeding. Decide how important it is for you to get your pre-natal body back. It ends up being a LOT of hard work for some moms, so you need to set some realistic expectations for yourself. Working out with a newborn is HARD (which is why I didn’t do it!) but I do think you will feel significantly better about yourself if you stay active. Katie is a pre and post-natal exercise specialist and nutritionist that sells a course that solves for things like regaining your core strength, fixing your pelvic floor, and figuring out what you should eat to help healing happen faster. Adding a baby shower to my third trimester checklist was the furthest thing from my mind when I was pregnant, but luckily my loving grandmother got everything taken care of for me. Even if you don’t have family that can help, host your own! I am not very comfortable with situations where the majority of the focus is me, but I am happy we did it. Not only do you get a lot of really useful baby stuff, but you can celebrate something that truly should be celebrated. If you are low on cash, remember it is possible to throw a baby shower on a budget. I know we all know how important self care for new moms is, but it’s easier said than done. Now is your last chance to do things baby-free. I know for me, self-care stuff was hard because all I wanted to do was sleep. However, sleeping is SO uncomfortable in the third trimester so it’s rough. Get a massage or give yourself a spa day. Take a bath EVERY day (I definitely did!) because it may be a while before you can again. If you have any yearly exams that will be due in the next couple of months, take care of them now. Dental care is SUPER important in pregnancy – as it can definitely wreck your teeth if you aren’t careful. If your pets have any yearly exams or vaccines coming up, make sure and jot those down for your third trimester checklist too. We were surprised when we found that we didn’t spend a lot of time with our first baby in HER room. I was nursing and changing diapers all over the house. It was incredibly inconvenient at first, as I had to run to the other end of the house to get a diaper. Then I would leave the diaper changing stuff out, thus creating clutter. I got smarter with my second and set up diaper and nursing stations in each room that we spent time in. I bought a couple of plastic Tupperware and kept the following in them. Although sometimes I NEEDED more then these supplies, I at least had ready access to the things I used the most. We have some in depth information regarding the postpartum necessities you will definitely want to pick up. It’s important to do this shopping BEFORE you are postpartum. For me, there were a couple of things that were key to my recovery. If nothing else, make sure you are well stocked with stool softeners, pads, a water bottle, and Ibuprofen. Having someone who can help take care of baby that first week is very important. You will be painful, tired, and emotional. Don’t make yourself do that alone. It’s not always realistic to pack up and leave somewhere with your partner, but IF you can – you should! Before my first was born, my husband and I took an anniversary trip for a couple of nights. We ended up walking around town and had a great time enjoying each other. Your entire life and relationship dynamic is about to change. Trust me. Relationships after baby are MUCH harder. Take this last chance to do something fun as a couple, instead of the family you will become. Figuring out when to go to the hospital can be tricky. Although some doctors have different standards they go by, generally if you are experiencing strong contractions every 4 – 5 minutes for a couple of hours, it’s time to call the doc. I hear contractions can be tricky (I was induced with both of my children), so an app is the way to go so you can make sure you are keeping track. Adding home duties to your third trimester checklist will help ease some of the stress that comes along with having a new baby at home. You are going to want to wash all of the clothing and bedding with which you are expecting your littles to come into direct contact. If you received a lot of clothing for baby, make sure that you strategically wash only what you think you will end up using. Remember that babies grow quickly, and it’s highly unlikely the store will let you exchange sizes with a freshly laundered tagless onesie. With my first daughter, we received a lot of newborn and 0-3 month clothing. When I say a lot, I mean that baby had more clothes in these sizes than I have in my entire closet. Before she was born I bought baby-safe laundry detergent, and I got to washing. It was a waste of time and money. She grew fast, and we ended up with a garbage bag full of clothing she never wore. Most people will tell you that the nursery is one of the most important agenda items on your third trimester checklist. Since I am a planner we had our nursery finished by the time I was four months pregnant. Truth be told, we only entered her room a handful of times those first six months after she was born. She slept in our room, and during the day we usually hung out in the living or dining room. You will eventually have to set up their room, so it’s definitely not a bad idea, but it also doesn’t need to be the first priority. Decorating the nursery is a part of nesting, and should be enjoyable. Don’t rush it or let it stress you out–remember; your baby won’t care about the jungle mural you are painting on the wall for a few years. I deep cleaned EVERYTHING in my house with my first baby. I get very stressed with a dirty house, so I thought that would be important to me. 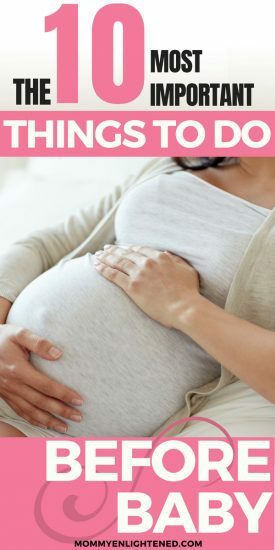 I promise you will be less stressed and be able to spend more time with your baby if cleaning is a big priority on your third trimester checklist. Take this time to declutter your space. For me, that meant I got rid of everything I haven’t used in the last year. Although I ended up replacing some of those things eventually, it was worth getting it out of my space for a time. It’s important to make sure you clean up the areas that are touched the most. Get some Clorox wipes and wipe down all of your doorknobs, light switches, and sinks. I don’t think many of us plan to have any guest sleepovers for a while after baby is born. Regardless, it’s still worth picking up some extra toothpaste and setting out some extra towels. Sometimes you WILL need a break – and it’s better to stay prepared. Every third trimester checklist article will remind you of this – but it really is a lifesaver! Personally, I think you are better off making pre-baby freezer meals in the second trimester (since you are so tired in the third! ), but doing it late is better than not at all. We made a couple of freezer meals and had family that also brought some over. Encourage your loved ones to help prepare these if they want to do something nice for you. Gather supplies as if you were preparing for an apocalypse. I am only sorta kidding. Things like toilet paper, paper towels, paper plates, plastic cups, and silverware will make your life easier. Yes, it’s a little more wasteful – but it’s a trade. Less stress = better bonding with your baby. Among other things. You and your partner need to figure out how you will handle finances after your baby is born. I was incredibly overwhelmed for the first month or so after bringing my baby home. If I had to worry about bills at that time, they probably wouldn’t have gotten paid. Put everything on autopay if you can. Our bank allows us to put everything on autopay through them, so we didn’t even have to talk to our different credit card companies about our options. The third trimester is full of more testing and visits. It’s important to have a good understanding of them. There are some specific things that your doctor will want to test you for in the last trimester. These can cause a lot of anxiety if you don’t understand the underlying reasoning behind the testing. Hilary, an L&D nurse has a free prenatal course that goes over third trimester testing. This is especially worth checking out if you have a high-risk pregnancy. In your third trimester, your doctor will want to start seeing you every two weeks. Once you get to 36 weeks, this increases up to once a week. That means if you are still working, it’s important to let your boss know that these doctor visits will get more frequent. Your baby’s movement will increase during the third trimester, and you should start feeling more daytime movement. Watch for patterns. Keep in mind, babies move off and on so not feeling movement is not immediately a cause for concern. If you don’t feel your baby’s movement, eat a snack and lie down for a moment. If you still don’t feel movement, go to the hospital immediately. Your baby’s movement is VERY important to track and is a good indicator of how your baby is doing. There are specific things that you need to do for your baby (so you are ready to bring baby home) during the third trimester. Choosing your baby’s health provider can seem like a pretty daunting task, especially considering the number of options you have. In my area, I had my choice of hundreds of doctors within a fifty-mile radius. I was willing to drive fifty miles to the perfect doctor, but it (luckily) wasn’t necessary. If you have a healthy amount of options to choose from, it’s incredibly likely that one of those options will be a good fit for your family. There are a few different factors that should play into your decision once you start narrowing your choices down. -Does your insurance cover that provider? Someone out of your network will likely be a lot more costly, and so doing this first will rule out all of the unrealistic options. -Do you have any recommendations from close family or friends? I did not have any friends or family close to me with little kids, and so I was not able to get kudos for a specific provider. Count yourself lucky if your bestie can give you a glowing review for her pediatrician. -How far away is the facility from your home? Do you care about distance? Even if you don’t care about the distance, it may be smarter to go with a provider who is closer to you. Not all pediatricians work with nearby hospitals, but many of them do. If you ever had an emergency with your child and had to get them to the nearest hospital, you will probably be more comfortable taking them to a hospital to which your provider has ties. -Does the doctor have good online reviews? Reviews can be a little sticky. Personally, I am suspicious of any provider or business that boasts all five-star reviews since some shadier companies will pay for excellent reviews. Paid reviews are not the norm, but still worth keeping in mind. Thoroughly research reviews from different websites, and see if you can get a feel for the people reviewing. I have found Facebook reviews to be really helpful, as I get to read the review and see the person who wrote it. Most pediatric facilities have a website, and this website usually has a short and sweet bio about the provider/s. Reading their little blurb will help give you a window into their beliefs and standards and hopefully give you some insight regarding whether or not you will connect well in person. You might also learn a few things that help ensure that your doctor’s values align with your intentions as a parent. We originally selected a doctor who had no children, but who had hobbies in common with my husband. We ended up switching to a lady doctor who had kids of her own and could speak from personal experience and not just training. Both doctors were fantastic, but the latter better aligned with our needs and expectations. Most articles will encourage you to meet the pediatrician before the baby comes. I did not do this, as the thought of it made me uncomfortable. It felt awkward and strange to me, but it helps seal the deal for some people. If you are like me, you may have purchased some neat looking contraptions to make your life with baby more comfortable. Your third trimester checklist needs to include putting batteries in any swings, putting together your bassinet, and figuring out how to use that breast pump. You don’t want to be trying to do these things on the fly with a screaming baby. While you may have already purchased the fancy baby bath and that organic shampoo, have you thought about products that may help when baby isn’t feeling very good? Now, I am certainly not a doctor, but I will say that there are simple issues that your baby will inevitably have that are easy for you to take care of at home. While I am not going to go into those specific health issues, here are a couple essential items to have in your baby health kit. Please check with your doctor before giving your child any kind of medication. to a baby under three months without consulting your doctor. That doesn’t mean that you can’t use it–it just means you want to ensure you are giving a correct dosage since your tiny baby doesn’t allow for a lot of wiggle room. That means it’s crucial to call the doc before giving any. Also, if you are concerned that your baby may need Tylenol, they may be sick enough to warrant a doctor visit. They should give you one of these Baby Nasal Aspirator’s while you are in the hospital. Buy an extra to keep on hand – but DON’T lose the one you get at the hospital. I don’t know why..but it just works better. is an alternative treatment for things like colic. Colic is super common in babies, and it causes a lot of stomach pain and screaming for hours from your little one. Some parents swear by gripe water for helping soothe those upset tummies. I didn’t feel that I saw a difference, but my husband would tell a different story. contain real medication (unlike Gripe Water which is herbs and water). This medication breaks up gas bubbles in your baby’s stomach–theoretically. The problem is that neither Gripe Water or Simethicone have been proven more effective in treating colic. Pick up both and see what works better for your baby. You may also find that you prefer using a syringe as well. Also, it’s good to have an extra on hand since they are easy to misplace. Hopefully, you won’t have to deal with a cut or a scrape for at least a year. It’s still a good idea to have some things on hand just in case.
. Keep in mind that you don’t want to use anything topically without approval from your doctor. Congrats on almost being done, mama. I know that it can be overwhelming to think of all of the tasks you still need to complete on your third trimester checklist, but remember you CAN get through it – and you will. In the end, it’s all going to be worth it when you can hold your brand new baby. Good luck! What have you found to be the best way to prepare for your new baby? I would love to hear your thoughts in the comment section below!